Recent release “Perdition” from Page Publishing author Dennis Noel is the third and final installment in the successful Mea Culpa – A Way Out of Hell trilogy chronicling Dennis’s turbulent past and ultimate redemption. Perdition focuses exclusively on Dennis’s incarceration in New Mexico and how [he] found atonement in the most incongruous of scenarios. 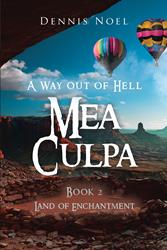 Dennis Noel, has completed his new book “MEA CULPA - A Way Out Of Hell: Perdition”: the shocking and unflinching conclusion to the Mea Culpa – A Way Out of Hell trilogy. The third and final installment focuses exclusively on the author’s incarceration in the New Mexico prison system and his day-to-day experiences there. Through [his] determination to abolish evil even under the most unpleasant and difficult circumstances, “Perdition” is Dennis’s no-holds-barred narrative about what it really takes to redeem and atone for one’s sins and rise from the ashes of a turbulent and disturbing past to reconnect with society. Published by New York City-based Page Publishing, Dennis Noel’s brutally honest work offers a satisfying conclusion to the Mea Culpa – A Way Out of Hell trilogy as well as a shocking look into the New Mexico prison system and stark reminder that ultimately, [we] reap what [we] sow. Readers who wish to experience this gripping and inspiring work can purchase “Mea Culpa – A Way Out of Hell: Perdition” at bookstores everywhere, or online at the Apple iTunes store, Amazon, Google Play or Barnes and Noble. Page Publishing is a traditional New York based full-service publishing house that handles all of the intricacies involved in publishing its authors’ books, including distribution in the world’s largest retail outlets and royalty generation. Page Publishing knows that authors need to be free to create - not bogged down with complicated business issues like eBook conversion, establishing wholesale accounts, shipping, taxes and the like. Its roster of authors can leave behind these tedious, complex and time-consuming issues, and focus on their passion: writing and creating. Learn more at http://www.pagepublishing.com.